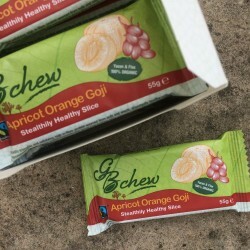 GB chew was set up by Lucy Ponsonby when trained as a chef at Leiths School of Food and Wine. Lucy became aware of how much refined sugar and processed food was in our everyday diet. She experienced the impact herself, only 10 minutes after the sugar hit she was hungry and a little brain fogged! From 2014 she experimented with recipes from Green Bean vintage van for 18 months, this was a great way to develop the recipes. 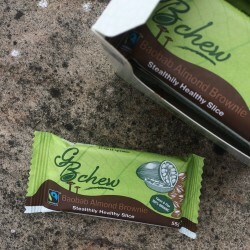 Her quest was to resolve the unsatisfactory trade-off in the sweet snack category for health aware consumers, who love good food to enjoy with a cuppa or a drink, on the go, even with their kids. They would fret over the choice between refined sugar-fused confectionery and bakery products or bland and small health bars which all, in different ways, fall short of what they desired. They truly craved a healthy sweet snack with mouth-watering flavour, texture, substance and satisfaction. 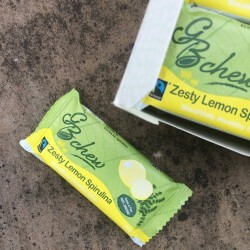 That’s what Lucy created, unique balanced nutritious recipes, enhancing your digestion and made entirely socially responsible ingredients to be chewed and savoured with delight. Above all once you chew, you truly enjoy it because it tastes better than the bad stuff. That’s why we call it a Stealthily Healthy Slice.